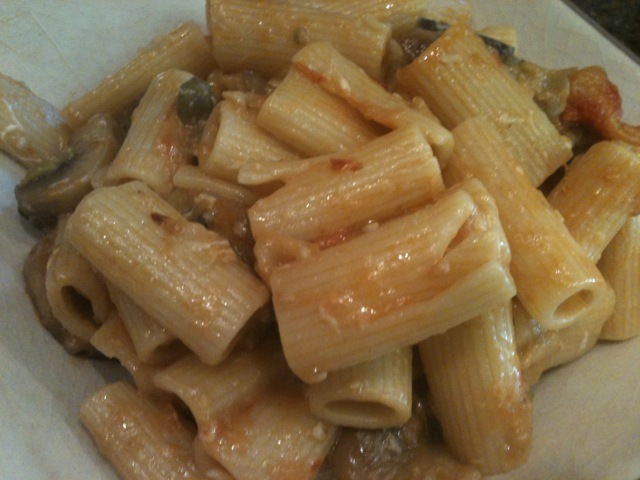 Here I will showcase one of my favorite ways to use eggplant in a Sicilian-style pasta dish with a spicy tomato sauce. What gives this recipe its Sicilian touch is the use of olives and capers, which works really well to kick up the flavor of the somewhat bland eggplant.I’ll admit that for many years, eggplant was not one of my favorite vegetables, one I only really ate in heavy dishes such as Eggplant Parmesan. 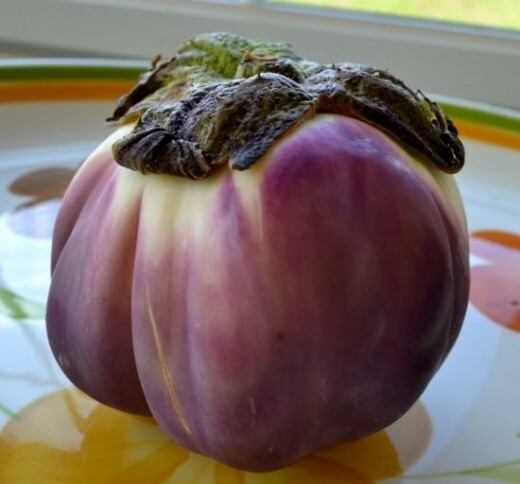 What made me truly fall in love with eggplant was discovering Italian heirloom variety known as Rosa Bianca, which is becoming increasingly popular and frequently grown in my area of southern New Jersey. These smaller, round and lighter-purple eggplant tend to be sweeter in flavor and creamier in texture compared to the standard large dark purple eggplant. Their size also makes them more compatible for cooking a small meal for one or two instead of feeding a whole family! 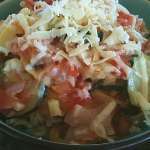 However, either variety of eggplant can be used in this recipe, depending on your tastes and available eggplants. 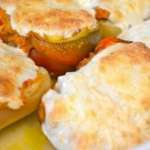 I hope you give it a try and enjoy it – even picky children are likely to enjoy the rich and flavorful tomato sauce, and the gooey texture of the mozzarella cheese. 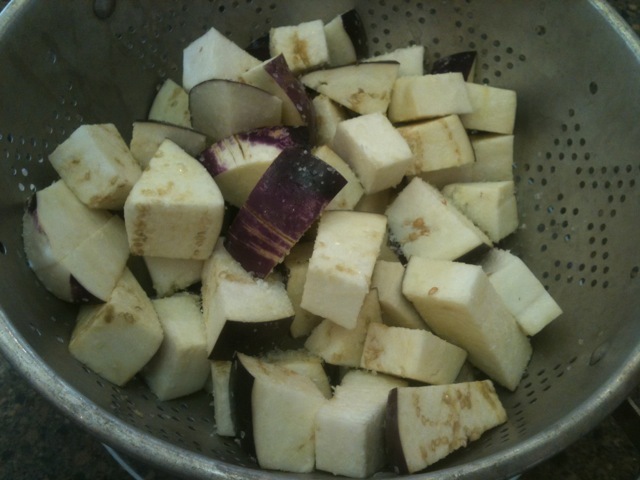 Wash and cut eggplant into 1-inch cubes. Place in colander over bowl or plate and coat generously with coarse Kosher salt. Let stand for 30-60 minutes, until eggplant are sweating and releasing water. Meanwhile, prepare other ingredients. Peel and crush garlic cloves. Wash capers. 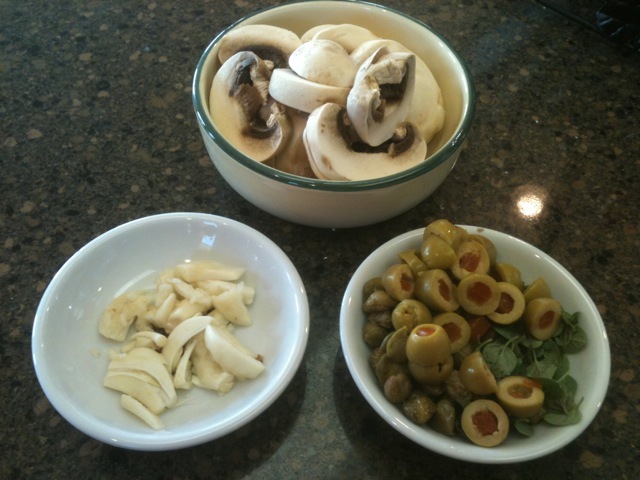 Slice olives and slice mushroom thickly. Fill stock pot with generously salted (at least 1 tablespoon) water. Bring water to a boil. 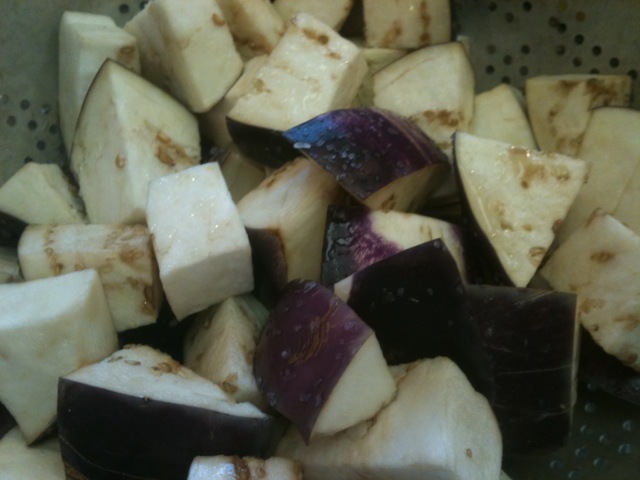 Rinse salt off eggplant and lightly squeeze out any remaining water. Heat olive oil in large saute pan over medium-high heat. Add garlic, red pepper flakes and eggplant and cook until fragrant and lightly browned, about 5 minutes. Remove garlic cloves if desiring a milder flavor or if browning too quickly. Add the mushrooms and cook an additional 2 minutes. Add pasta noodles to boiling water and watch clock for appropriate cooking time. 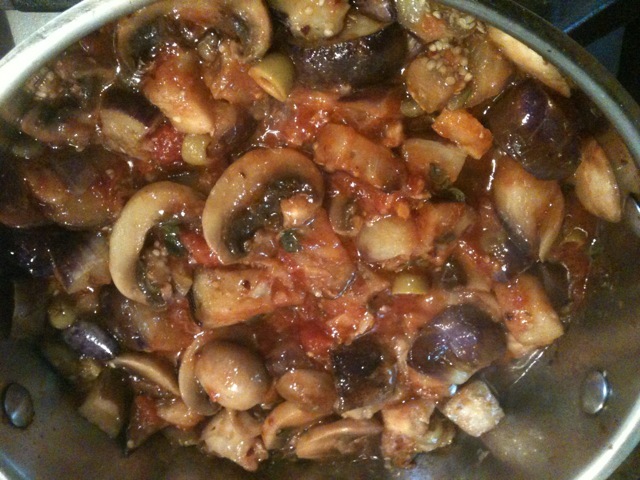 Meanwhile, add oregano, tomatoes, capers and olives to eggplant. Stir and reduce heat to a low simmer. Cook sauce for 10 minutes then remove from heat. Drain pasta, then return to stove in stock pot. Add sauce and mozzarella. Mix together gently over very low heat until mozzarella is melted and mixed with pasta. Taste and adjust seasoning as necessary. While a simple recipe, there are a few steps and techniques to pay extra attention to, in order to get the best results. Salting the eggplant removes the bitterness which can often mar its flavor. 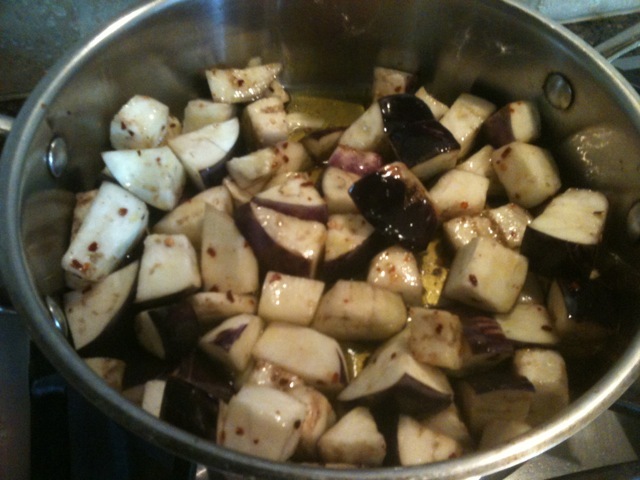 It also softens the eggplant so it cooks through quickly, so it’s important not to cook it into mush. Therefore I definitely recommend not skipping this step, even if it takes some time. Just use that half-hour to prepare the other ingredients and perhaps a side salad or garlic bread to make a complete meal. Be sure the olive oil is quite hot before adding the eggplant, so that it will properly brown and fry quickly – instead of absorbing too much of the oil at a lower temperature and ending up greasy. 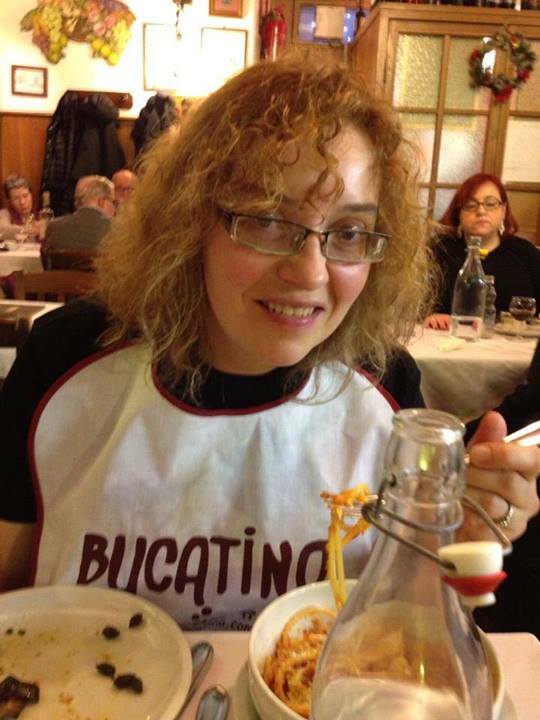 Drain the pasta while still al dente to finish cooking once you’ve added the sauce and mozzarella. This will keep the pasta from being overdone, and also help the flavor of the sauce infuse the noodles properly. Resist the urge to add any salt until finished combining pasta, sauce and cheese. 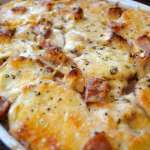 The capers, olives and cheese are likely to add all the saltiness needed to bring out the rest of the flavors in this dish. Crushing the garlic cloves instead of finely chopping them gives a mellower flavor to the dish, which could easily be overpowered by too much garlic taste. It also allows those with a sensitivity to garlic to remove the cooked garlic from their plate if desired. You can also choose to use less than 4 cloves or omit the garlic completely – perhaps substituting some chopped onion for a different flavor. 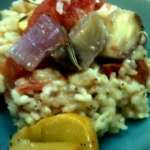 This entry was posted in Cooking and tagged easy recipe, eggplant, italian recipe, pasta recipes, sicilian, sicilian eggplant, summer vegetables, tomatoes. Bookmark the permalink.